Since I know y'all are curious... we're still in the midst of negotiations on the house, believe it or not! This process is such a crazy, emotional, stress-inducing thing. I know buying a house is always a crazy process, but I can't help but think that our situation has to be worse than normal. We're up to six or seven rounds of counteroffers now (not quite sure... I've lost count), and poor Jeff has spent about three of the last 24 hours on the phone with our realtor. It's such a big thing, buying a house. It's emotional (I mean... we're dealing with the possibility of having a different home! ), it's financial (obviously), it's spiritual (What does God want from us? Are we supposed to be doing this? What's the plan for us? ), and it's just so permanent, you know? I so badly wanted to know one way or another by the end of this week, but it's not looking like that will happen, and since Jeff's going out of town for work next week, it may have to wait even longer. Absolutely crazy. Jeff was playing the piano when I got home. He heard me come in, turned around, pointed at the flowers, and matter-of-factly said, "I got you those 'cause I like you." Sigh. How is it that after eight years of knowing this guy, one little sentence can still make my heart just totally melt? How sweet! Those are gorgeous flowers. Good luck with the house stuff---hope it works out for you! I'll be praying for you about the house! I think it's a wonderful thing to be liked by my husband! Sometimes liking each other is the hard part, not the loving part. Good luck with all of the house stuff...I know it can be very stressful! 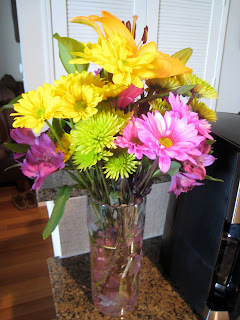 And yay for flowers from husbands that like and love us! :) Have a great weekend. That is so sweet! Its always nice when husbands do things just because. I can't imagine thinking about buying a house! We are looking at RENTING a house and I'm freaking. Good luck!! Hope you get it!! Thats so sweet! Yall are so precious! husbands are the best! i hope everything works out with the house!